Replacement vacuum filter cartridge made to fit Shopvac vacuums. This vacuum filter fits Shop Vac models including Hang Up Vacs, 5 Gallon Portable Contractor (H875), Floormaster Plus, All Around Plus, and Heavy Duty Portable. Fits utility vac models including QMH, QSH, QMH, QSH, 971-07-00, 971-08-00, 971-09-00 with red tanks. 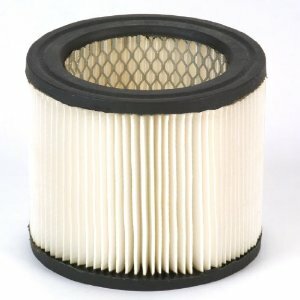 This replacement vacuum filter is best for dry pickup only. Original Shop-Vac part numbers: 903-98, 903-98-00, 9039800.